In September 2016 the United States Agency for International Development, Office of U.S. Foreign Disaster Assistance (USAID/OFDA) awarded a three-year Cooperative Agreement to FIU for the Disaster Resilience in the Americas Program (DRCAP). The program will help advance disaster risk reduction (DRR) by addressing existing risks in Latin America and the Caribbean (LAC) and by confronting the drivers of new risk, in addition to developing capabilities and mechanisms for increasing resilience, particularly given ongoing climate change dynamics. The DRCAP strategy comprises five dimensions: 1) Advocacy, which promotes DRR by mainstreaming it into LAC region higher education institutions; 2) Technical Assistance, which provides DRR technical advice to governmental and non-governmental organizations; 3) Capacity-Building, which provides knowledge, tools, skills, and methods to underpin evidence-based learning; 4) Network Fostering and Strengthening, which emphasizes outreach and enabling skills to individuals and institutions to serve as agents of change; and 5) Applied Research, which identifies gaps and opportunities in thematic DRR areas (e.g., unplanned urban settlements, misperception of risk, DRR intervention effectiveness) and how to address the gaps and take advantage of opportunities. Residents of Part-Au-Prince, Haiti after the 2010 earthquake. 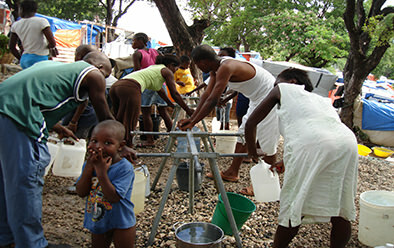 Water, Sanitation, and Hygiene Sector Status and Trends Assessment (WASH) of Haiti projects performed in 2010. 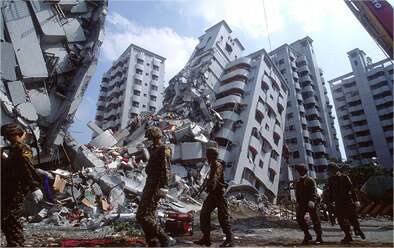 Taiwan Earthquake; Sep 07, 1999. 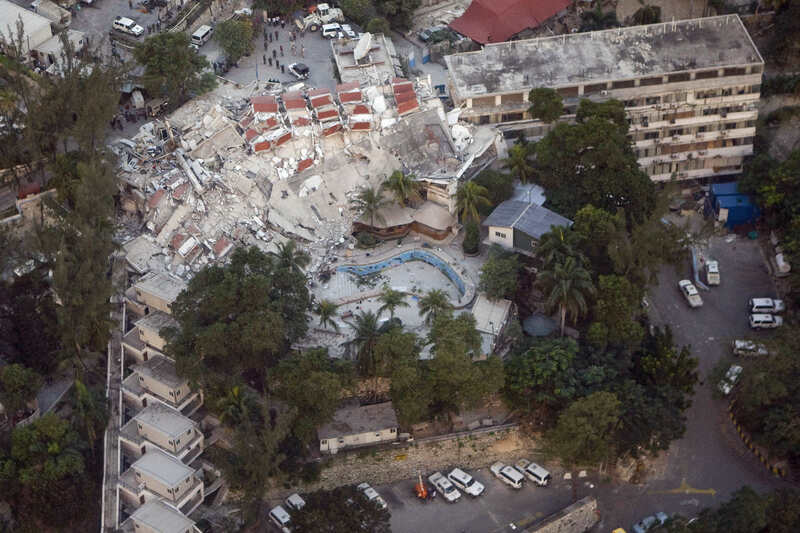 The city of Tai Chung is struck by a huge earthquake killing more than 2,000 people. Taiwanese Army rescue workers hurry to find survivors in the mass destruction. The private sector annually accounts for approximately 80 percent of all investment worldwide, and in the United Nations Sendai Framework for Disaster Risk Reduction 2015-2030, which was adopted in March 2015 by 187 national governments, the term “private sector” appears 33 times in only 27 pages. Building on and integrating two prior UN-led efforts – the Private Sector Partnership (PSP) and the initiative for Disaster Risk-Sensitive Investments (R!SE) – to more fully involve the private sector in systematic disaster risk reduction, the United Nations International Strategy for Disaster Reduction (UNISDR) launched ARISE, the Private Sector Alliance for Disaster Resilient Societies, on November 6, 2015 in London. The Extreme Events Institute had worked closely with the UNISDR on the foundational Global Assessment Report on Disaster Risk Reduction (the 2011, 2013, and 2015 issues), was an integral part of the original R!SE, and remains a leader in the new ARISE Work Stream 4: Disaster Risk Management Education and Training. The EEI role with ARISE is to help create and/or strengthen disaster risk management (DRM) courses and modules in (a) university-level curricula, particularly at the M.A./M.S. levels, and (b) training programs for small and medium enterprises (SMEs). 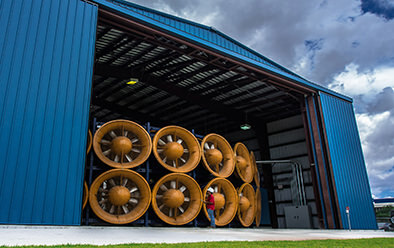 The FIU 12-fan Wall of Wind ™ (WOW) is the largest and most powerful university research facility of its kind and is capable of simulating a Category 5 hurricane – the highest rating on the Saffir-Simpson Hurricane Wind Scale. This level of wind speed testing (with wind-driven rain) at large scales is leading to performance-based designs that are making a significant impact on mitigating hurricane damage and influencing enhanced building codes. Full-scale experimentation results have already been applied to the Florida Building Code. The National Science Foundation (NSF) has designated the Wall of Wind as one of the nation’s major “Experimental Facilities” under the Natural Hazards Engineering Research Infrastructure (NHERI) program as a distributed, multi-user national facility that provides the natural hazards research community with access to research infrastructure. The goal of the WOW facility as a NHERI-EF is to allow NSF-supported researchers to better understand wind effects on building systems and other structures and prevent wind hazards from becoming community disasters. Thus, the Wall of Wind is playing a critical role in advancing the understanding of hurricane impacts on buildings and developing and validating innovative damage mitigation products, thereby enhancing the disaster resilience of our communities and nation. Wall of Wind™ at the FIU Engineering and Computing Center. Hurricane Charley, 2004. 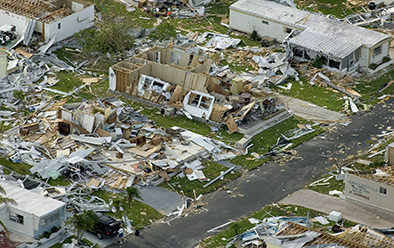 Aerial image of destroyed homes in Punta Gorda, following hurricane Charley. The Florida Public Hurricane Loss Model is the state’s only certified and transparent method of determining annual expected insured and probable maximum losses as a result of a hurricane and helping to set windstorm rates. Florida will be the first state to combine wind, storm surge and flood risks in a single public model to determine the overall hazards of a storm. The model assesses hurricane risk and projects annual expected insured losses and probable maximum loss for specific properties or portfolio of policies by coverage, construction type, zip code, county, and region in Florida. The model consists of three major components – wind, vulnerability, and actuarial insured loss. The model can also be used to conduct stress test on insurance companies and quantify the economic benefits of hurricane mitigation. IHRC professors lead the team that includes specialists from the University of Florida, Florida State University, Florida Institute of Technology, Hurricane Research Division of NOAA, University of Miami, Notre Dame University and West Virginia University. These experts and the project will make the Extreme Events Institute the leading center for innovative hurricane risk and loss research. The Coastal and Estuarine Storm Tide (CEST) model is used to estimate storm surge as low pressure weather systems, such as hurricanes and tropical storms, approach coastal areas. Storm surge and coastal flooding have become increasingly appreciated hazards, brought home so clearly by “Super Storm” Sandy. The research team is comprised of geoscientists, mathematicians, meteorologists, and computer scientists. The model takes into account the expected tide at landfall and the atmospheric pressure and wind characteristics of the weather system. It also takes into consideration major coastal topographic features such as coastal ridges and barrier islands. FIU’s research in partnership with the National Hurricane Center will be used to enhance storm surge models for future operational forecasts when a hurricane approaches. 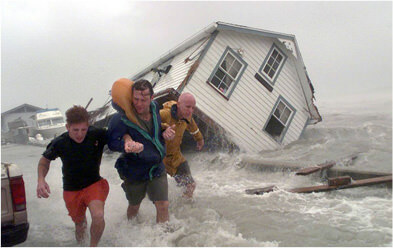 Key West residents fleeing Hurricane Wilma storm surge in 2005.